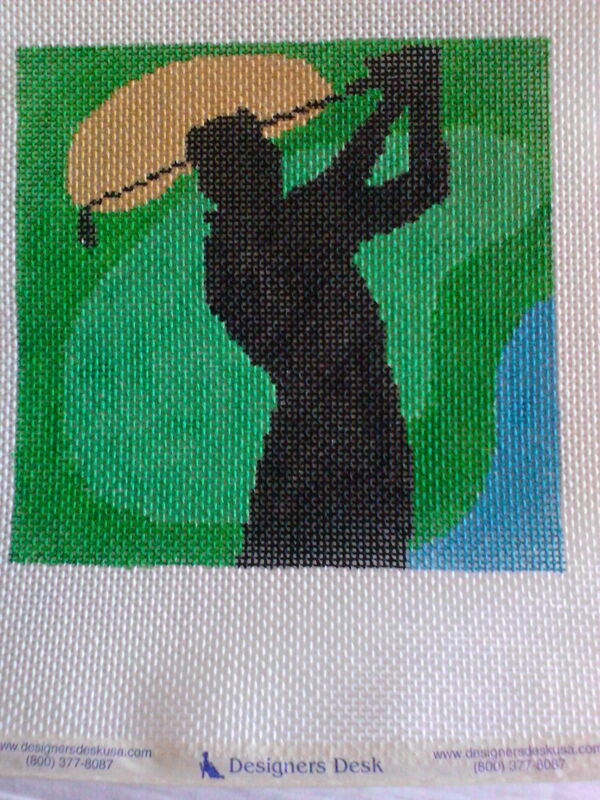 Bill golfed earlier today & I finished his golfer earlier tonight. He won’t have it by Christmas (not worth paying extra) but we’ll drop it off on our next trip downtown (Rittenhouse Needlepoint – they did a great finishing on my sunglass case). 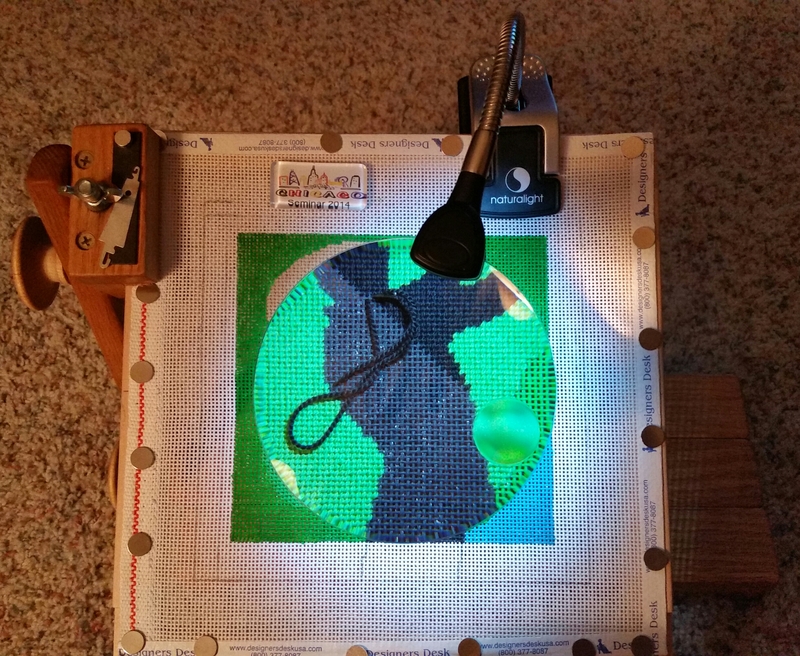 The black area was a lot easier to stitch thanks to the StarMag that Karen at Nimble Needle recommended. I wanted a clip-on with a flexible arm, magnifier, & a light. Something easy for travel. And, not costing an arm and a leg. I got all that!!! Bonus is that it can be used as freestanding table lamp. 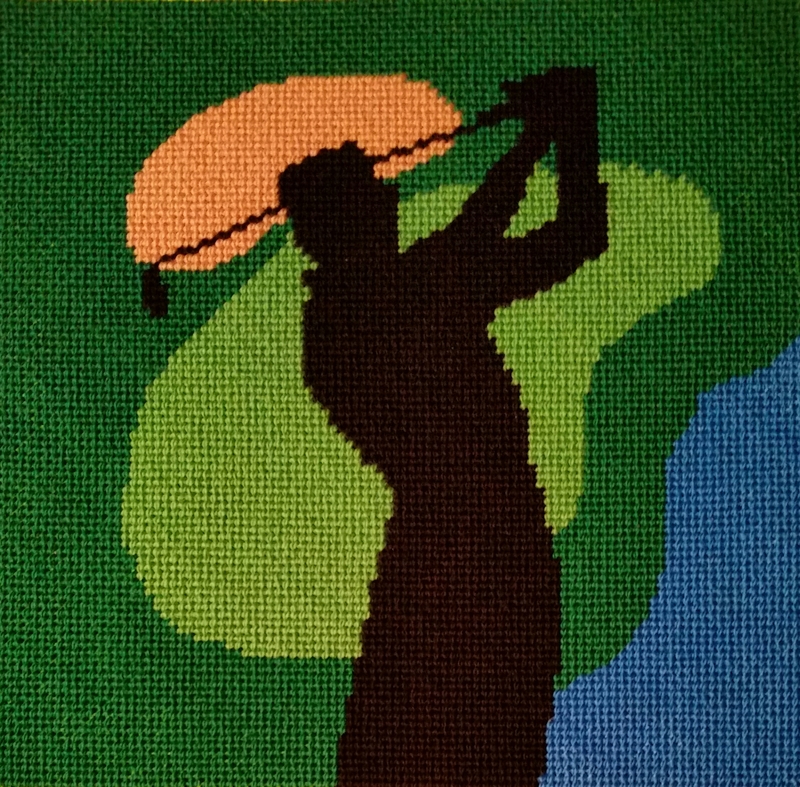 I got out my Jacquard Textile paints in order to expand the fairway (& water) in order to make the area 7 & 1/4″ square. That should be enough to make an eye glass case for my husband’s sunglasses. I want the holder lined & his sunglasses are kind of big the way they fold. The color dried lighter and isn’t an exact match, but I just wanted some color under the thread anyway. It’s working fine & I’m really glad I pulled out the paints. Using Vineyard Merino wool on 14 count probably would have allowed some white to be seen. But, with the painted canvas, it is fine. I think on the back 9 now!! 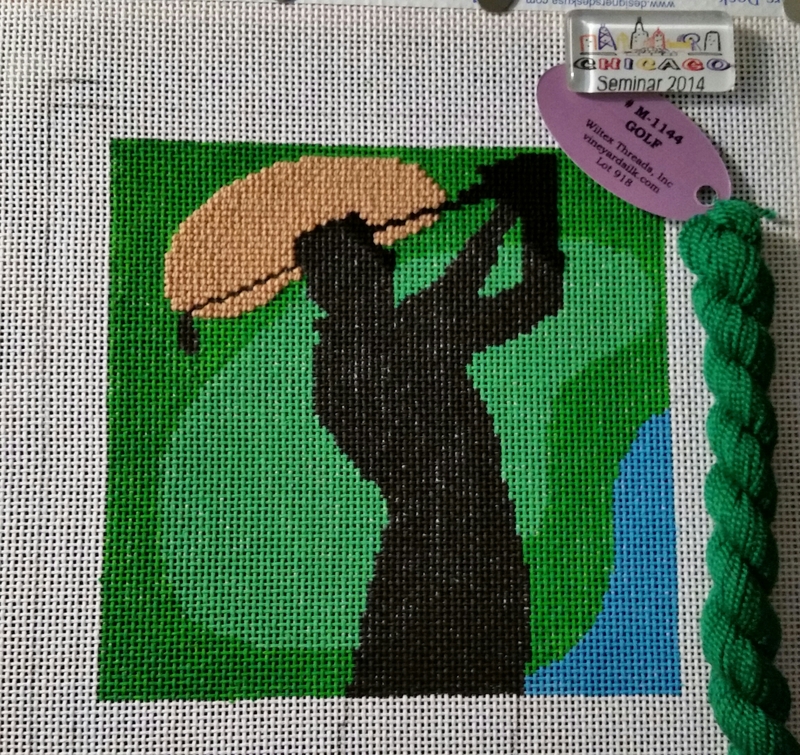 This was a piece I picked up at Designer’s Desk while at the 2014 ANG seminar in Chicago for Bill & mentioned previously (https://melitastitches4fun.wordpress.com/2014/08/26/golfing-husband-at-seminar/). I did not have threads in my stash to match. I almost never do even though I think I have every green! And, I realize now that DMC Perle cotton isn’t as durable as wool – which is what I should have used on my husband’s Philly key chain because it is showing significant wear. So, I stopped at Stitch Haus (sort of on my way home from work – I am so lucky to be close to so many shops) & picked up Vineyard Merino. I had thought the canvas was 18 count but they correctly pointed out it was 14 count. Since they weren’t 100% sure Vineyard Merino would cover enough, they suggested I test it in a black area first & not pull too tightly. It is working out great. And, I love that the colors matched the canvas so exactly! The green is even named “Golf” (M-1144) for the long grass! I also picked up “English Ivy” (M-1197) for the putting green, “Straw” (M-1047) for the sand trap, “Seaport” (M-1206) for the water, and “Jet Black” (M-1111) for the silhouette of the golfer/club. The interesting thing I noticed was that the thread wasn’t twisting (one of my usual problems with most threads). It wasn’t until I read Mary Corbet’s post about “The Needle You Need!” when I understood better about the benefits of the chenille needle that I’m using for my Gentle Waves piece. I had it out because that has such thick threads & just decided to use it for this piece because of the 14 count canvas. According to Mary, the larger eye has “more room for the thread to move around in there without getting mauled” and “Wool just works better with them. Try it!! 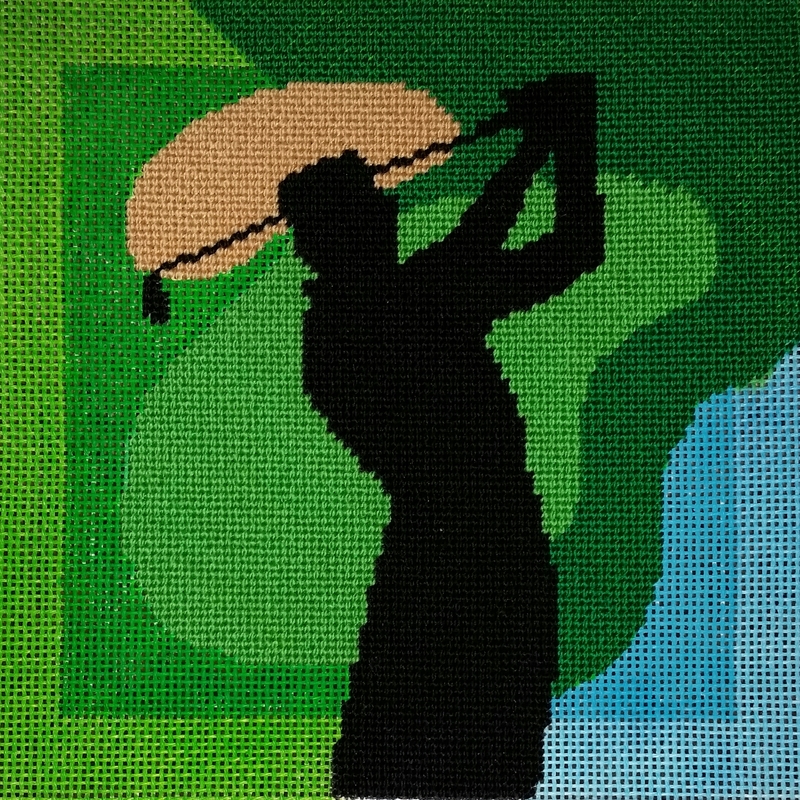 You’ll be surprised how much easier it is to control wool thread, to keep it intact and less fuzzy, and to stitch with it in general.” I stumbled into it & now I know why the chenille needle is working so well for the golfer! I’ll have to select my needles more thoughtfully in the future. The pencil lines indicate the area I’m going to stitch in order to make this big enough to get finished into an eye-glass case for him – for his sunglasses!! He wanted to know if it’d be done by Christmas. I said more likely that it would go to the finisher about then but I’m not paying extra to get a rush job on this – it’ll be ready by Spring golf. I am kind of jumping back & forth chronologically. But, I was busy with setting up, meeting people including fellow Distance Learning colleagues, CyberPointers folks, teachers, pilot stitchers, & chatting with people from previous seminars. Can you guess this will be for Bill? I got it at Designers Desk in Geneva, IL. I’ll probably have threads in my stash. We drove out from Chicago on Saturday & stopped at the third magic store for Bill. Later that evening, the Magic show at Magic Inc with Tony & Josie was incredible. We ended another great day in Chicago at Billy Goat Tavern.